Coming into Talladega, Kurt Busch had no sponsorship for his car. So instead, he decided to run his car decked out in full Ricky Bobby livery — straight from the movie Talladega Nights — in this Sunday’s real race. They’ll even be playing the roles of the characters from the movie on the in-car communications. 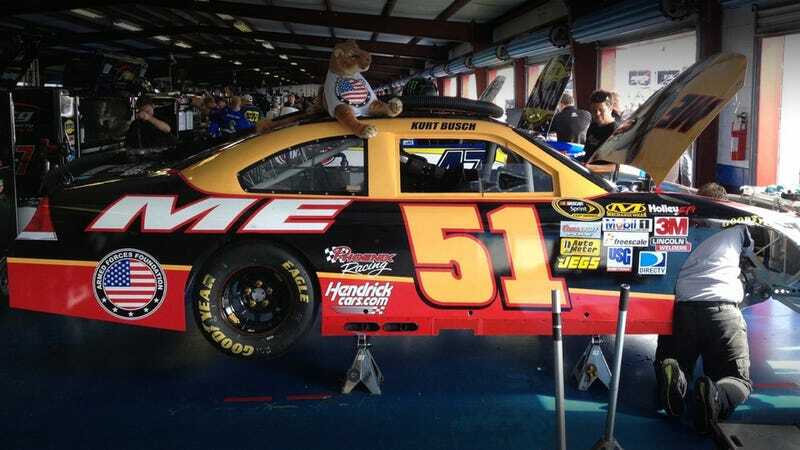 If you remember, in the movie, Ricky Bobby’s team had no sponsorship and were forced to paint their car with the word “Me” — because the only person they relied on was Ricky Bobby himself. Also, there was a cougar plastered on the hood — because of something having to do with dealing with adversity. As is often the case, reality finds a way to ironically mirror fiction, as Kurt Busch’s Phoenix Racing has no sponsorship for this weekend’s race at Talladega — they decided to sport the same “Me” paint scheme. Busch’s whole team is in on it, and everyone will play characters from the movie through the race weekend, even on radio communications. Busch’s girlfriend, Patricia Driscoll, had been working on the livery for the car the past two months, aiming to use the brand to promote the Armed Forces Foundation — an organization she works for that does charitable work for soldiers with post-traumatic stress disorder. Apparently, the executives at Sony Pictures weren’t originally receptive to the idea — ironic, especially considering they didn’t ask for permission from the brands that were on the car in the movie, like Wonder Breads. Driscoll was rejected by the lower-level execs, but when she managed to get in touch with the studio’s president, he immediately and enthusiastically supported the plan. • The picture of the cougar on the car is actually “Karen,” the cougar who co-starred in the movie. Because Busch’s car needed to use the photo, Driscoll had to get permission from Karen’s handler – and the photographer who took the picture for the hood. • Every company whose logo appeared on the movie car had to agree not to be on the real-life version. • Will Ferrell’s people had to agree to Busch’s use of the car.